How do the writers of Riddley Walker and A Clockwork Orange present the future in their novels? How do the writers of Riddley Walker and A Clockwork Orange present the future in their novels? 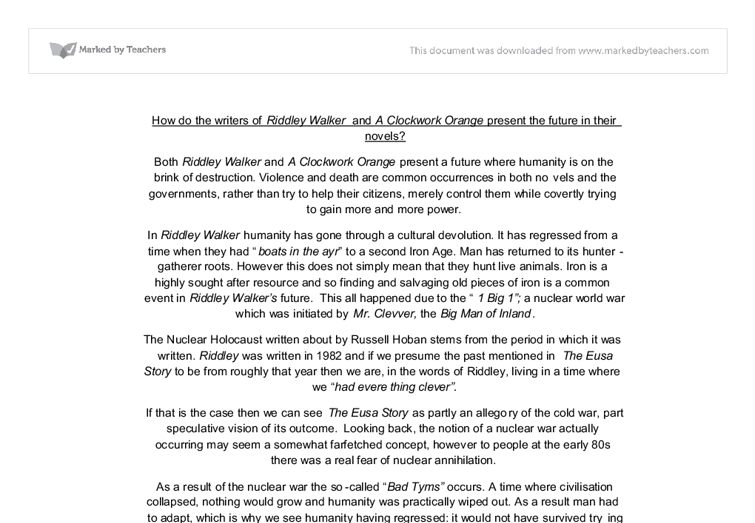 Both Riddley Walker and A Clockwork Orange present a future where humanity is on the brink of destruction. Violence and death are common occurrences in both novels and the governments, rather than try to help their citizens, merely control them while covertly trying to gain more and more power. In Riddley Walker humanity has gone through a cultural devolution. It has regressed from a time when they had "boats in the ayr" to a second Iron Age. Man has returned to its hunter-gatherer roots. However this does not simply mean that they hunt live animals. Iron is a highly sought after resource and so finding and salvaging old pieces of iron is a common event in Riddley Walker's future. This all happened due to the "1 Big 1"; a nuclear world war which was initiated by Mr. Clevver, the Big Man of Inland. The Nuclear Holocaust written about by Russell Hoban stems from the period in which it was written. 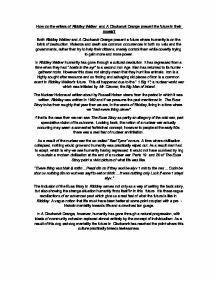 Riddley was written in 1982 and if we presume the past mentioned in The Eusa Story to be from roughly that year then we are, in the words of Riddley, living in a time where we "had evere thing clever". ...read more. The portrayal of the government in both novels seems to match the portrayal of the party in Nineteen Eighty-Four, where they seek power only for their own benefits. As O'Brien puts it: "The party seeks power for its own sake ... We are interested solely in power ... pure power". This is also an apt assesment of the governments in both novels. The government in Clockwork seems to have legitimacy. It has been elected on a mandate of reducing crime. They intend to do this through the use of conditioning to "kill the criminal instinct". However, this plan ends up backfiring on them after Alex's suicide attempt. They manipulate the people through the use of propaganda. For example when Alex is in hospital they have him agree to have his photo taken with The Minister of the Inferior/Interior and to publicly support them in return for a good job. They also use the violent gangs as a form of vigilante police force to stop people being out at night. The police procedure towards the gangs is clearly half-hearted and it seems the government believes the ends justify the means. In Riddley the government is not the same as what we conjure up when we think of a government. ...read more. In Riddley the outlook seems bleak. Humanity is no better off. Foraging for iron still occurs as do puppet shows (however with a different subject matter and theme). There is no government and Riddley is now a social outcast. He will be forced to forever live on the fringes of society, travelling with his puppet show from town to town. The children make a song about Riddley: "Riddley Walkers ben to show Riddley Walker on the go Dont go Riddley Walkers track Drop Johns ryding on his back" Riddley previously mentioned that once children start singing about your actions then you are stuck on your set path, even if you manage to make the children stop singing. Riddley, however, says that he "wunt have no other track". He is accepting of his life and now has the ability to stop people making the same mistake as before. The novel ends on a quiet note of optimism. Both authors had very different views of what the future would be like. They however both wrote cautionary tales. Attempts to warn us of what the future could be like through speculation of eventual outcomes of different aspects of humanity. In doing so they presented us with a window to look through and information on the means to avoid such bleak fates. ...read more. A Clockwork Orange - critique. Anthony Burgess died at seventy-six, November 25, 1993 of cancer (Cohen). The novel's main theme deals with free choice and spiritual freedom. Anthony Burgess expresses his view that no matter how "good" one's actions are, unless one has free moral choice, he is spiritually damned (Malafry). He says, "Pardon, madam, most sorry to disturb you..." which shows that he is more than capable of speaking in a civilized and 'normal' way, as in not in nadsat speak. It was important to keep this as well as phrases 'singly the best audience' and his own idiolect 'right', 'well', 'hey', 'so', to indicate his regional origin. Jerry has an informal register that contains much ellipsis, such as "you're singly the best" and "here 'cause you love". He becomes sub-human, and he is merely a robotic existence. But when one has a choice, he is an individual. When one who is free, chooses good, it is out of moral conscience and good intent. He chooses to do good. The discharge officer, much to the likely hood of the doctors, uses his superiour power over Alex "Would you like to punch me in the face?" This shows how the discharge officer is testing Alex, almost framing him to a violent action the same way the droogs did. How is Alex characterised by Burgess in Part 1 of A Clockwork Orange?